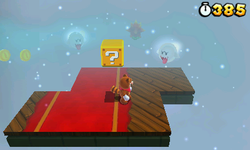 Special 6-5 is the fifth level of Special 6 in Super Mario 3D Land. It is based off of World 8-4. The player starts off on a platform. Going right leads to part of the platform that will detach itself and start moving past some thorny flowers and Boos. After this segment is a Switchboard that goes past more Boos and some moving stones. After a Checkpoint Flag and a rotating platform, with Big Boos and a Super Star on it, another platform moves past some Spiky Plants, some Peepas, some Boos and some Big Boos. After this, the platform will drop and the player will be next to the door. Outside is another moving platform that leads to the Goal Pole. Star Medal 1: Floating to the left of the Roulette Block. Star Medal 2: On the rotating platform with the Big Boos and the Super Star. Star Medal 3: In a small opening above some Coins, before the door.